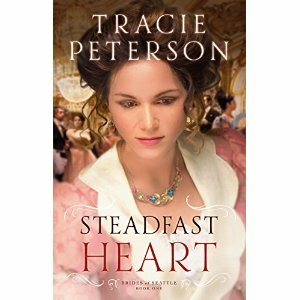 "Steadfast Heart" takes place in a time period where manners and being a lady are very important. A lot of the story takes place in a Bridal School, which I feel is a very interesting background. The first couple chapters really grabbed my attention and I read though them pretty fast. We are introduced to two friends, Lenore and Abrianna. They seem to me to be complete opposites and this is very intriguing to me. As I keep reading we begin to see more of Abrianna and less of Lenore. Lenore actually goes away and isn't in the story very much at all. This really throws me off, because as you know the back of the book list Lenore and Kolbein and love interests. I felt like the author focused too much on Abrianna and her story and I was so confused who the main characters were. I understand having other story-lines to compliment, but it just got to where I was no longer interested in Lenore. Abrianna was the stronger character and I was just dying to find out what she was doing. I don't want to give a lot of the story away, but there were a lot of things that happened that were just too unbelievable. Overall, I had to give it 2 stars. After the first 100 pages it no longer held my attention and I lost interest in the main characters. I like a romance that is realistic and has characters I can relate to. This just didn't do it for me. I have read all of Julie Klassen's books, but The Secret of Pembrooke Park tops the list as my favorite. It has it all, twists and turns, romance, wonderfully written characters. The number one thing I liked about this book is the pace. I feel like every detail is thought through and it builds up to a perfect ending. When you are first introduced to Abigail, you can feel all of her emotions and relate to them. She goes through so many things as a young women and I remember and relate to all of them, for example first love and the need to please your parents. Klassen builds the setting up for the deserted mansion in such a way that you are completely there with her. There were several times I had to put the book down at night and wait till morning. Klassen did a great job of keeping you interested and guessing throughout the whole book. I have always been a romance reader, but the way Klassen writes I am almost more interested in the mystery of it then the romance part. Now that's a good writer! If you like a good mystery then "The Secret of Pembrooke Park" is the right book for you! I can't wait for more Klassen books! I received this book for free from Bethany House Publishers in exchange for my review.